SAN MARCOS  The 48 point per game averaging Hutto Hippos were taken down by the Crosby Cougars 31 to 25 last Saturday in the State Quarter-finals at Bobcat Stadium. The score does not reflect Crosbys outstanding defensive play against a team that manufactured every kind of offensive strike. Our team is young and hungery, said Coach Riordan, We have had a revolving chair of running backs all this year. DOntal Allen had a big year for us he got hurt. Crosby ISD closes Friday and some local businesses will too to attend the semi-state playoff game at 8:00 p.m. in Austin at the Darrel K. Royal Memorial Stadium against the Cedar Park Timberwolves. 2) The safety of the over 6,000 members of the Crosby Community that will be making the drive to Austin Friday. 3) Prioritizing instruction – CISD students will gain both quantity and quality of instructional time by going to school for a full day later on in the Spring versus a half of a day now. 4) Loss of Revenue – Anticipating that many families making the trip to Austin would have kept their children home from school anyway, the district will realize higher attendance rates in the Spring versus this Friday. 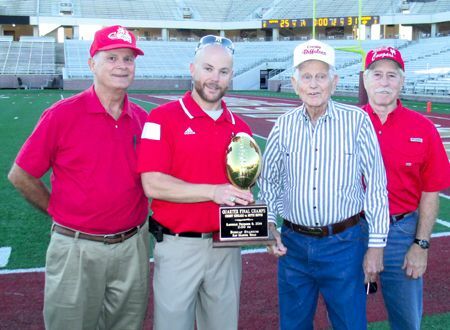 The pregame mood of the Cougars fans was brilliant optimism having been given the moniker cowbell ringing rednecks was a symbol of pride for the red shirt clad chock full Crosby side of the Stadium. The game began with the Hippos getting the toss and down the field they pushed the Crosby team until suddenly at the twenty yard line, all momentum shifted to Crosby. The Hippos lost 10 yards on a beautiful sack. The Cougars would get the turn around fumble and two plays later Williams would score. The Hippos had to be asking if it was a fluke, was it just a bad hand off, had their signals been read, did the ball simply slip from their runners hand? The Hippos started back down-field from the kickoff and everything was going their way until it wasnt and they were stopped short and had to settle for a field goal. Cotton connected with Emmanuel Netherly for a 37-yard touchdown pass. The Hippos showed some of the grit that would get them such high scores during the regular season to make a touchdown but the extra point would be no good, Crosby defenders could seriously be heard to pop leather with the Hippo offense. The Cougars would end the half showing that they can hit the long field goal. Hunter Hearn of Crosby would be the alert defensive player to rob the Hippos of a near certain score after the longest drive during the third quarter, snatching up the fumble – the momentum shifted again. Cotton and Williams teamed time and again for a bunch of pass runs in the third quarter but not so many in the fourth. 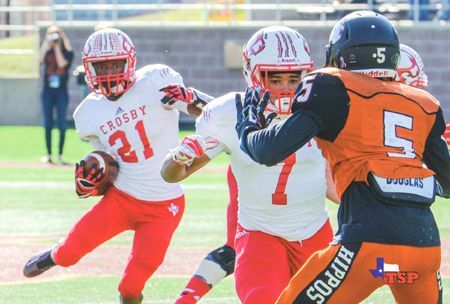 There was daylight ahead of the Crosby receivers in the third quarter and a touchdown put Cougars up 24 to 9 then 31 to 12 after Hutto had fully four downs in the red zone but had to settle again for the field goal. Joseph Pinkney played an outstanding defensive game. That is why I say we have the receipts for success you have a great defense and ew are physical and we can run the ball thatis how you play in all levels of football. said Riordan. It was the Cougars time to wonder how the momentum shifted in the fourth quarter. They seemed unable to manufacture the run for any yardage or pass. But the defense still had some tricks knocking the Hippos back on several downs. The Hippos scored on an on-side kick and come away with a short yardage possession. They then attempted that tactic twice again. The Crosby team stayed poised during this onslaught that would give the Hippos 13 unanswered points in the fourth quarter. And as if that were not enough as Crosby was looking for the clock to run down but it stopped ticking off the seconds. Three times the referees had to adjust the time. Up until the Cougar defense intercepted for the second time then time flew again. The Cougars were unable to move much in the fourth quarter.